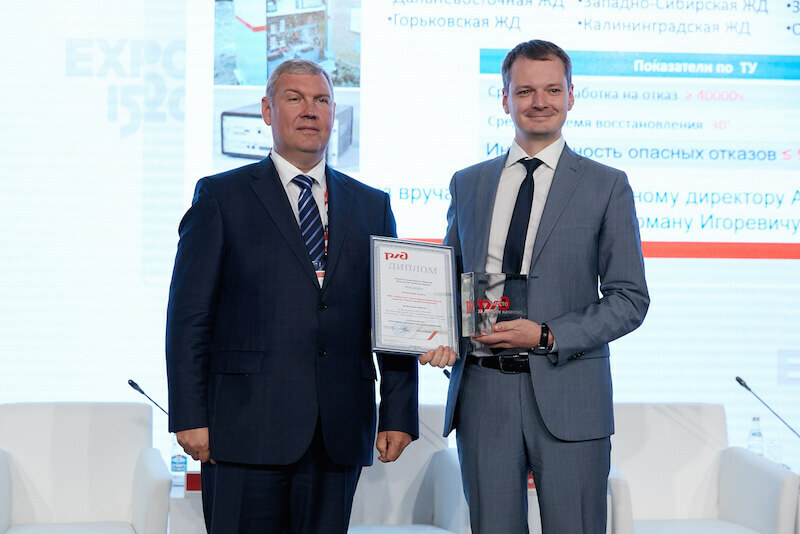 On August 30th at the Sixth International Fair of Railway Equipment and Technologies EXPO 1520 in Moscow, Russian Railways (RZD), awarded the winners of the Contest for the best quality of rolling stock and complex technical systems. RZD chose the best suppliers of quality and reliable products which are used efficiently at main lines throughout Russia. The microprocessor semi-automatic block system MPB developed by R&P Centre “Promelectronica” took second place in the “Diagnostic and Control Systems” category. CEO, Mr. German Tilk, was presented the prestigious award by the Senior Vice President of RZD, Mr. Sergey Kobzev. This is the fourth time a Promelectronica product has won in this Contest. In 2015 they received the RZD award for the microprocessor level-crossing protection system; in 2013 – for the axle counting system ESSO; and in 2012 – for the microprocessor interlocking system MPC-I. Regular success for R&P Centre “Promelectronica” in this contest shows its interest in safety and quality of products and services. Original article © R&P Centre “Promelectronica”. FOR ALL THE LATEST INFORMATION, NEWS, IMAGES, VIDEOS AND DOCUMENTS FROM R&P CENTRE “PROMELECTRONICA”, PLEASE CLICK HERE.